We did this Saturday to simulate some racing as we have a big meet in two weeks and many of our kids haven’t swam a meet yet coming out of HS season. If you coach teenagers, they probably all have a camera phone. Have them pair up. Give them a prompt on what to work on (i.e. examine freestyle breathing technique, looking for horizontal head position) and give them 10-15 minutes to film each other and give each other feedback. Peer Coaching! 1. Tons of feedback for EVERY swimmer in your group, something that would take an individual coach hours to do by himself. 2. A chance to use a rapid feedback loop in a way that isn’t easy to do in a normal workout. Do it…watch it… do it again, better… watch it… do it again better still. 3. The teaching swimmer learns as well. Teaching is one of the best ways to learn. 4. Team bonding! Swimmers enjoy working together and helping each other improve. I promise you… give this a try and you will love it. If not, I will give you a full refund of your purchase price for this post. Reading books and articles from outside my areas of expertise have helped make me a better coach. Here are some of my favorite non-swimming books that I recommend you check out, in no particular order. Note: All links in this article are Amazon affiliate links, meaning that clicking on the link for the book titles and purchasing the book will kick some loose change to the Swimming Wizard without costing you a penny extra. Thank you for your support! Bowerman and the Men of Oregon by Kenny Moore. Bill Bowerman is to American distance running what Doc Counsilman is to American swimming; an innovator, a standard-setter, and a legend. This book is written by a former runner of his and will inspire you to be a better coach. Make It Stick; The Science of Successful Learning by Peter C. Brown, Henry L Roediger III, Mark A. McDaniel. Ultimately, as coaches we are teachers. This book will improve your understanding of how to make the material you are teaching “stick” so that your athletes can effectively put it into practice. Inside-Out Coaching: How Sports Can Transform Lives by Joe Ehrmann. If you have ever doubted your purpose as a coach or questioned why do this in the first place, Ehrmann will transform your coaching by explaining how you can transform the lives of your athletes. I have read this book at least 4 times and plan to read it again. Should be required reading for anyone going into youth coaching. When Pride Still Mattered by David Maraniss. There is perhaps no bigger legend in American coaching than Vince Lombardi. This tome peels back the layers to examine the complex man behind that legend. Relentless: From Good to Great to Unstoppable by Tim Grover. An inspiring read from the personal trainer to Michael Jordan, Kobe Bryant, and Dwyane Wade. I am currently reading this book to my team, chapter by chapter. It will make you uncomfortable by challenging your notion of your capabilities . Read it to find out if you are a Cooler, a Closer or a Cleaner. Queen Bees and Wannabes by Rosalind Wiseman. For all who coach young women, this book will open your eyes to what it is like to be young and female. Especially recommended if you have a daughter of your own. Wooden by John Wooden. Who better for the Swimming Wizard to recommend than the Wizard of Westwood? Sacred Hoops by Phil Jackson. I admired Jackson’s calmness on the sidelines through all of his success in the NBA. Great read for any coach who wants to be a better teacher, mentor, and person. 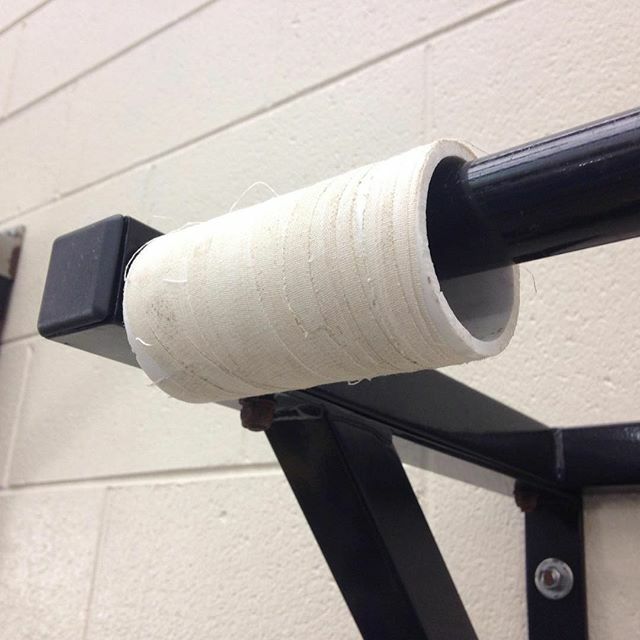 Get more out of your pullup by adding a thicker handle (made from a PVC pipe with athletic tape) to get a better forearm and hand workout. Have swimmers do a number of cycles rather than a certain distance. You can do this on a rest interval or on a regular interval. 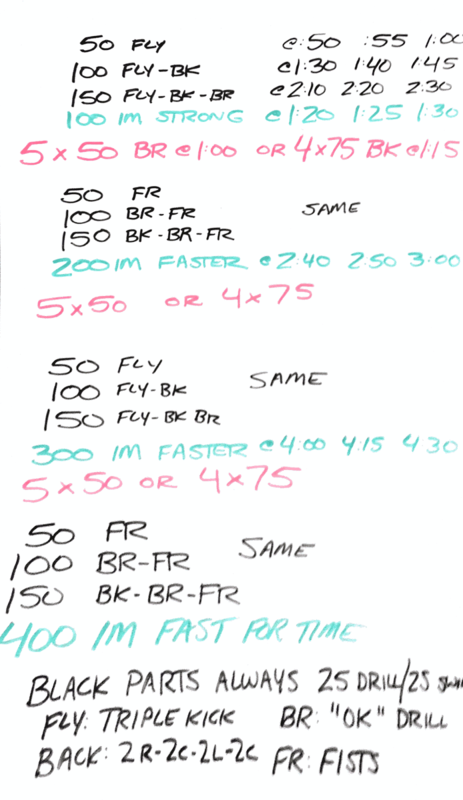 For example, instead of doing 6 x 100 free on 1:15, do 6 x 50 cycles freestyle on 1:15 or 10 seconds rest. 1 cycle = 2 strokes of free or back, 1 cycle = 1 stroke of breast or fly. Do swims or kicking for distance rather than for time. Instead of seeing how fast you can cover a certain distance, see how far you can go in a certain amount of time. Example set: 6 x 3:00 swim for distance on 4:00. Descend (increase distance) 1-3 and 4-6. Do swimming “fartleks” Have swimmers swim for a set amount of time, and change their skill, stroke, drill or speed according to instruction each time you bang a wrench on the side of the pool. This is good for getting aerobic swimming accomplished while sprinkling in technique work or speed work. Especially good in a large group with lots of different speeds. Leave your stopwatch at home. Time nothing for an entire day (or longer). This can free you up to focus on the quality of the movements your athletes are making and not worry about how fast they are going. Turn the pace clock off. This can help your athletes focus on their movements without worrying about making an interval or going a certain time. Put everything on an approximate rest interval. If you coach in a co-ed environment, separate the boys and girls into their own lanes and have them start at opposite ends of the pool. 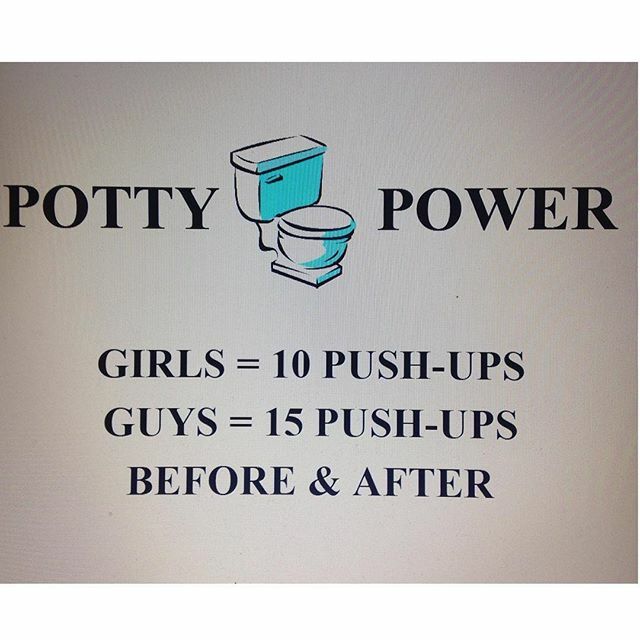 Watch how not having the genders interact for an entire workout changes the social dynamics of your practice. Take the lane lines out. Do a pool open water (POW) practice. 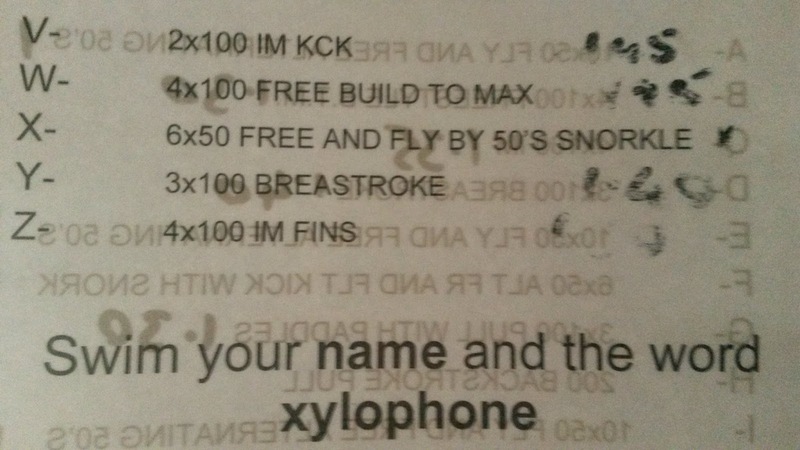 Have your swimmers write the workout. A few days ahead of time, split them into groups and ask them to come up with the sets. Give them total time, distance, intensity, or whatever instructions (or lack thereof) that you want. This will tell you a lot about the kind of swimmers you have. Start everything from the middle of the pool. This will add more turns to your workout and cut down a bit on excessive socializing while hanging on the wall. “Jungle Workout.” Start a set. Part of the way through, give one swimmer the details for the next set (which needs to start ASAP). Repeat again partway through that set and keep repeating. Keep them on their toes. Once you are done giving them sets, they have to go back and do whatever remains from each uncompleted set. 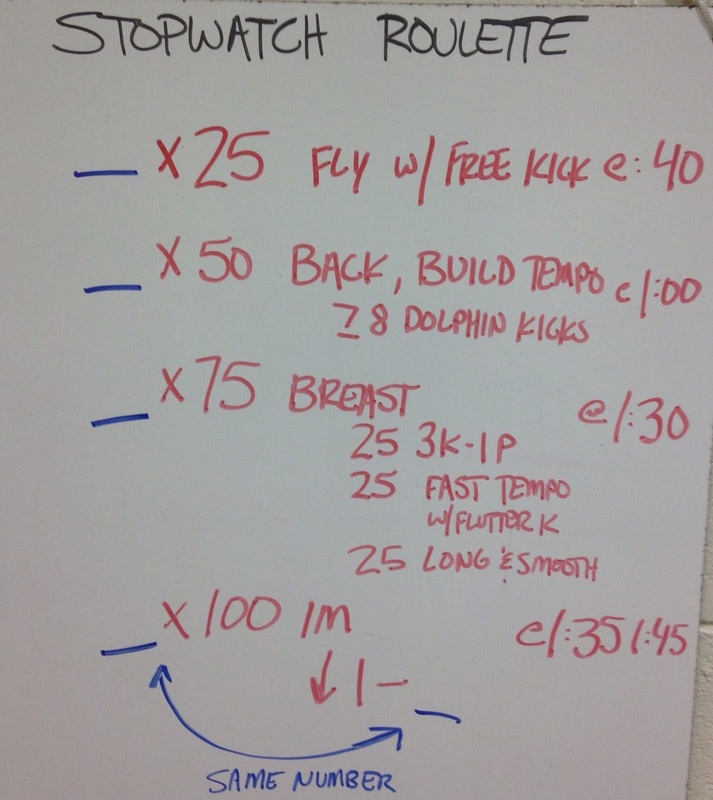 This practice will be chaotic but fun, as long as you have attentive swimmers. Write three different practices… Give them fun names. Let your athletes choose which workout they want to perform (on an individual basis). Some of our older boys were getting to 125 yards the other morning! It was interesting how “into it” they got — they turned it into quite a competition. This fantastic idea was originally posted in 2011. Place 25lb weight room plate on the bottom of the deep end (starting end). Swim 25 IM rotation, sprint back freestyle and at the flags(deep end) dive down and pull the weight back up to the surface. We used 10lb plates for the smaller swimmers. 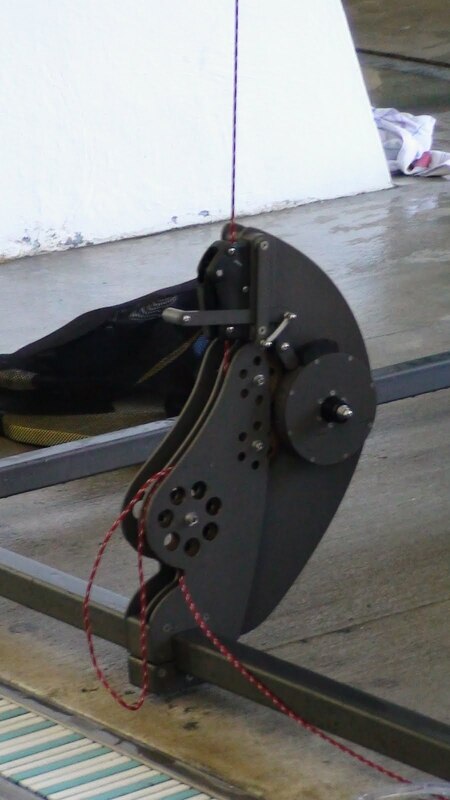 best if you held the weight out like a steering wheel. All 100's must be within 10 seconds for boys and 8 seconds for girls of the American record,all 200 must be within 20 seconds for boys and 16 seconds for girls, and the 400 IM I like to use 30. All the seconds you accumulate over the records add up for a total score. The lowest total boy's and girl's score set the “standard”. Set whatever time standard or “seconds over the record” that fits your group's ability. On a swim by swim basis for every second a swimmer misses the 10 or 8 over standard the swimmer will owe 2 burpees at the end of the entire set. 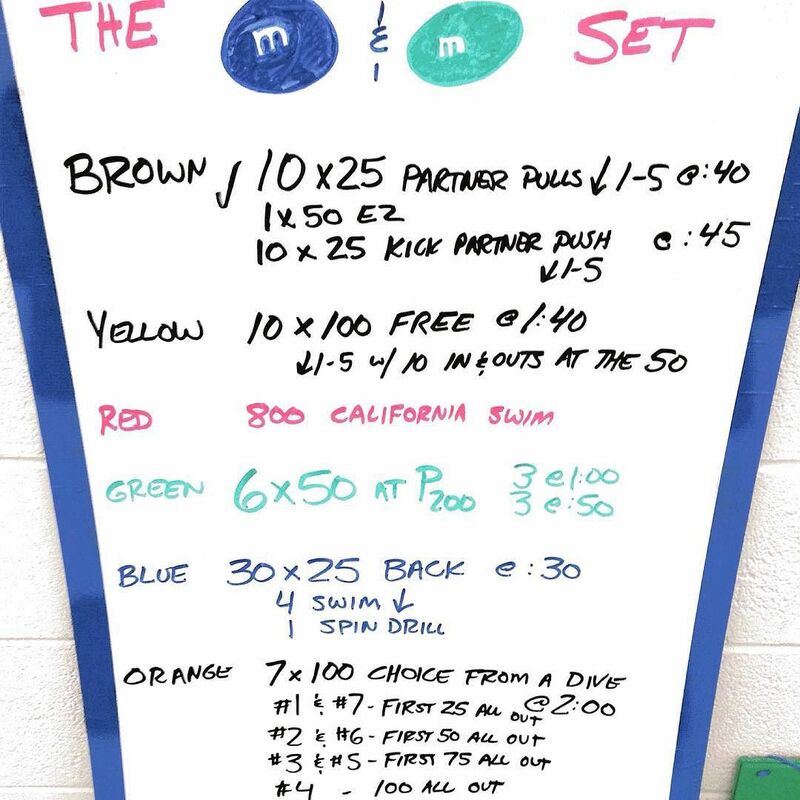 This set helps familiarize swimmers with the fastest times in every event. Do this set once per cycle and compare times. Have title belts/ and or plaques with a ceremony for the top girl and boy that rewards their well rounded IM racing focus. To improve your feel for the water, hold a tennis ball in each hand while you swim or drill. Instead of feeling the water with your hand, use your forearms to catch water. 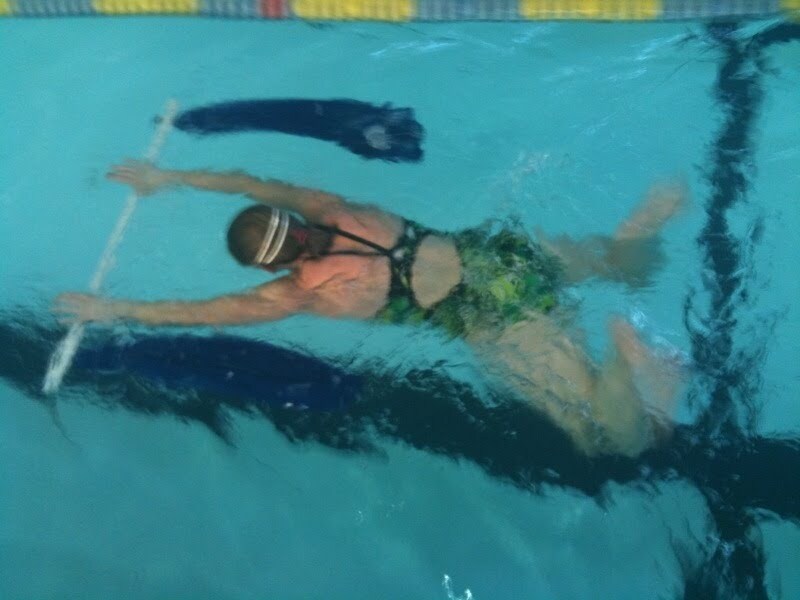 This drill is particularly good for freestyle or butterfly, but can be used for back and breast as well. 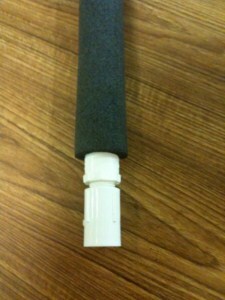 The effect is similar to anti-paddles, but in cheaper and more convenient form. After using the tennis balls for a few minutes, put them away and go back to swimming with an open hand. The shifting sensation can be instrumental in improving feel for the water. 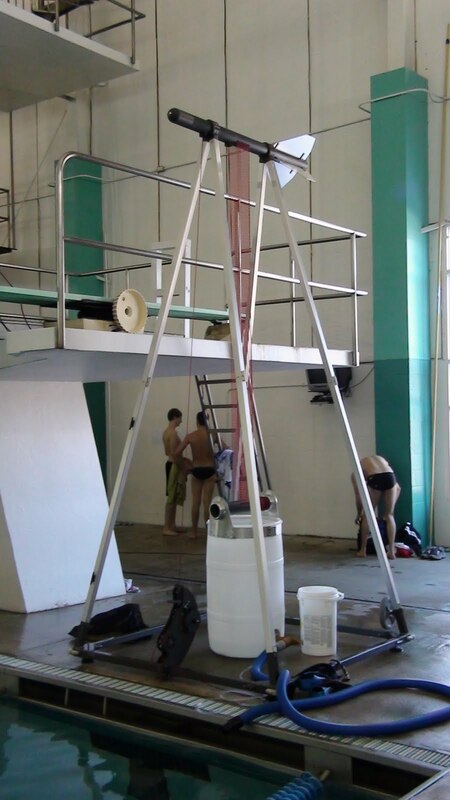 Often at practice it is helpful to have a tool to communicate with your swimmers while they train. I like to use a normal laneline wrench to bang on the stainless steel gutter. I use it to have the group change speeds during a long swim, shift from one drill to another, stop to kick, or any other task we are doing. 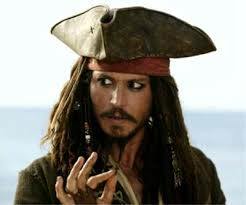 Use one bang for a certain command, two for another command, and so forth. 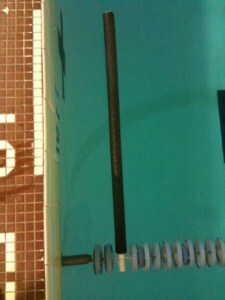 Swimmers can hear the wrench bangs far better than a whistle or any other noisemaker I have heard. 1. Dive off the blocks with your best streamline. 2. Glide until you come to a stop (no kicking). 3. Immediately sprint into the wall and turn at full speed. 4. Streamline and glide until you come to a complete stop. 5. Immediately sprint into the wall with a perfect finish. 6. Slowest time and/or least distance swum wins! The Perfect MoCo 50 = 1 stroke swum into the turn and 1 stroke swum into the finish). 9 Ways to Train I.M. We all know that I.M. is a great way to put some variety into your training. Here are some ways to put a little variety into your variety. 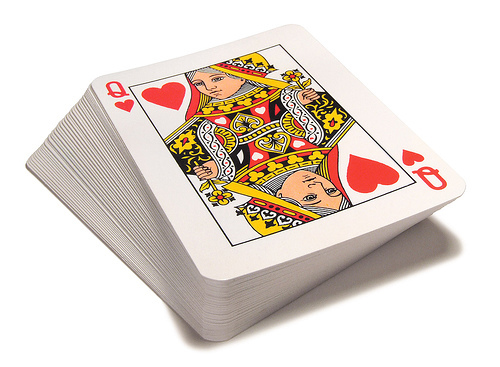 #1 – Reverse I.M. A commonly used version, simply swim the strokes in reverse order. #2 – Free I.M. Good for masters swimmers who are fly-reluctant or for any time that you want to get good back, breast, and free training without the butterfly. Simply substitute freestyle in for the butterfly portions of the I.M. #4 – Fat I.M. – Do these for lengths that are 25% longer than your standard I.M.-125s, 250s, 500s, etc. Double up on one of the strokes (this is the Fat stroke). A 250 Fat I.M. 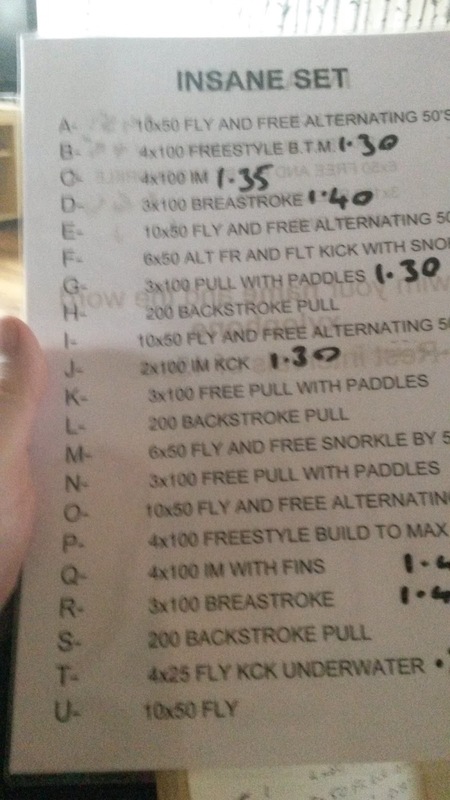 (Back) would thus be 50 Fly/100 back/50 breast/50 free. #6 – Emily I.M.- For swimmers with knee injuries/pain or whose breaststroke is not a focus of your efforts for improvement. Swim backstroke double the normal distance and leave out breaststroke altogether. Yes, this is named after a swimmer. #8 – Skinny I.M. This is the opposite of Fat I.M.s Swim distances like 175s, 350s, etc. Cut the distance of one stroke in half. #9 – Gator I.M. Alternate stroke and free. A 300 Gator I.M. would be 50 fly/50 free/50 back/50 free/50 breast/50 free. Do you have any other interesting or creative ways of training I.M.? Here is another “fun” thing we do at YOTA. 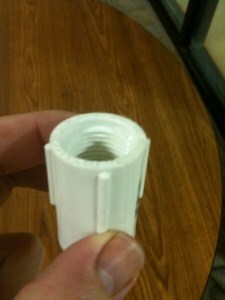 We have a 4 foot piece of 1/2 inch PVC piping that we drilled holes into on each side. We strung through a mesh bag on both sides. 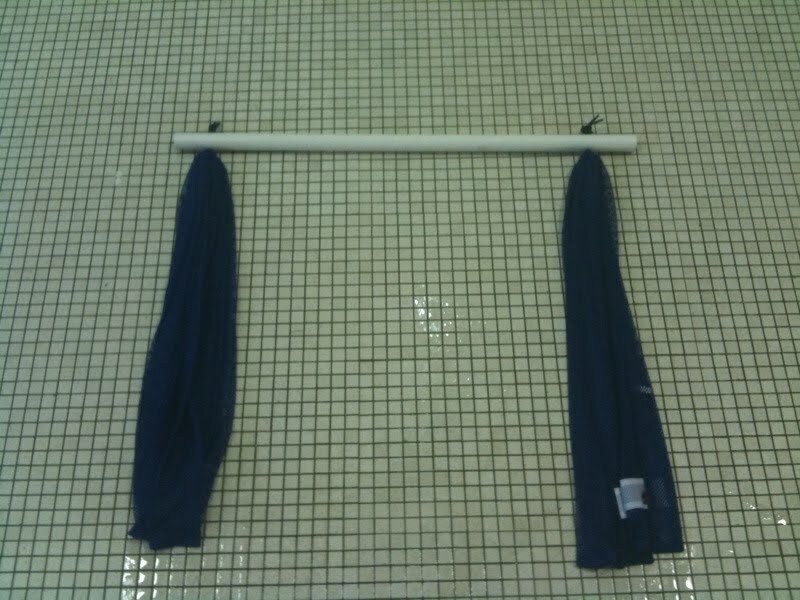 We use these “kick sticks” to focus on proper body position and core stability while kicking. The resistance of the mesh bags adds a bit of a challenge. We'll do a series of fast and moderate kicking, with a majority of the kicking underwater (no breath) or with a snorkel (proper head position). It breaks the monotony of using a kickboard or kicking on your back. You can kick with fins, shoes, snorkels – the possibilities are endless. It's a great tool to focus on strong, fast legs….. Note: These “Kick-out Sticks” or “Streamline Sticks” have been a topic of discussion since Streamline Sticks was published. Coach Onken has the best design we’ve seen so far presented below. 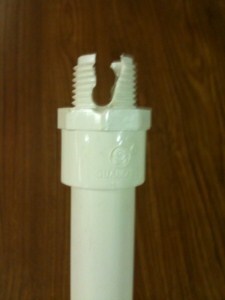 Picture #1 – pic of the end of the PVC pipe, with the male end super glued onto the edge of the PVC pipe. A divot was drilled into the male end to allow a slit where the lane rope cord will be. 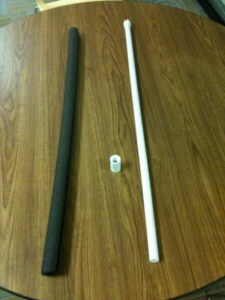 Picture #3 – the three components of the kick-out stick: the PVC insulation (black), the female piece which is threaded to fit the male piece that is super glued to the top of the PVC pipe. Picture #5 – the final product at work (very close to the wall). What makes this (soon to be patented – hahaha) product so great is that it allows for two way swimming in and out of walls and it is also completely moveable to different differences from the wall. You can make it as easy/challenging as you want it. The sticks are designed to take a beating, we have a few kids that consistently run into them all the time. And the best part is that they are very cheap – we were able to buy the supplies needed for a 6 lane pool for around $16. Ever wonder how much faster your swimmer would be if he would just fix his turns? Curious about the combination of tempos and cycle counts that will lead to the fastest time for your swimmer? Toy around with it a bit and let me know what you think. I am interested to hear any suggestions, and if anyone knows how to set this up in an html format, I would love to be able to put it on the web to eliminate the cumbersome excel download. The Swimming Calculator can also henceforth be found in the Tools for Coaches section at right.